Pleading the Sixth: “Nevada’s rural counties simply cannot shoulder the state’s obligations under the Sixth Amendment of the U.S. Constitution any longer,” announced Nevada Supreme Court Justice Michael Cherry in an official Court press release announcing the publication of the 6AC report Reclaiming Justice. 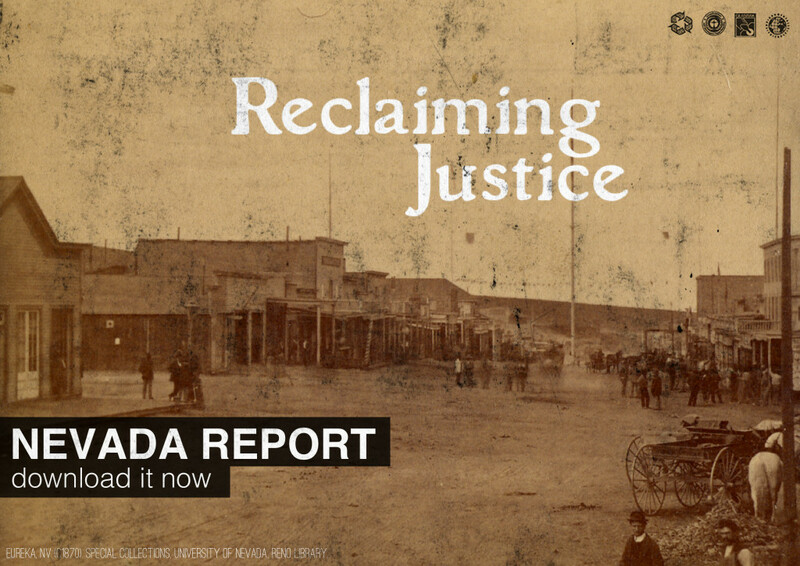 The report details Nevada’s first-in-the-nation status of requiring the appointment and payment of counsel in all cases, and how rural counties lost that commitment beginning in the mid-1970’s. “Judicial, Legislative, and Executive action is needed to restore Nevada’s historic and deep-rooted commitment to equal justice to the poor,” Justice Cherry stated. ”We need to fix this problem now,” Cherry explained in calling for a state-funded, state-administered independent commission overseeing services in the non-urban portions of the state. On March 22, 2013, the Nevada Supreme Court issued a press release calling for the state to intercede and fix the indigent defense crisis in the rural parts of the state. “While the nation has been celebrating the 50th anniversary of Gideon v. Wainwright – the landmark U.S. Supreme Court decision that guarantees indigent defendants the right to competent legal counsel – a new study indicates the milestone is not cause for celebration in rural Nevada,” the press statement said. The report by the Sixth Amendment Center (6AC), Reclaiming Justice, concludes that serious problems exist in the delivery of indigent defense services in rural Nevada, noting that the indigent accused may sit in jail for weeks if not months waiting to speak to an attorney. Even then, an individual defendant may be one of several hundred all vying at the same time for the attention of a single attorney. Worse, the overburdened attorney often has financial conflicts that pit his ability to put food on his family’s dinner table against his ethical duty to zealously advocate solely in the best interests of his client. Reclaiming Justice tells the story of how an indigent defendant, named Shepherd L. Wixom, accused of stagecoach robberies in Lander County in 1873 fought for the right to an attorney to advocate on his behalf, and how the reaction of the Nevada legislature and Supreme Court to secure a fair day in court for poor people far predates any federal action on the issue. Indeed, as early as 1875 to 1879 Nevada was the very first state in the union to authorize the appointment of attorneys in all criminal matters, including misdemeanors, and also required the payment of attorneys for the services rendered. Nevada’s commitment to equal justice reached its zenith in 1971. In the wake of Gideon v. Wainwright, the National Conference of Commissioners on Uniform State Laws, funded by the U.S. Department of Justice, published a Model Public Defender Act in 1970 that it recommended all state governments adopt. Following that recommendation, in 1971 the Nevada Legislature created the State Public Defender, overseen by an independent commission, as an executive branch agency charged with administering the constitutional mandate to provide competent lawyers to the poor in all counties other than Clark (Las Vegas) and Washoe (Reno). In 1975, only four years after creating the State Public Defender Commission, the Nevada Legislature did away with it and voted instead to make the State Public Defender a direct appointment by the Governor. Chief public defenders who are direct political appointees often take into account what they must do to please the Governor, rather than doing what is solely in the best interest of the defendants as ethics require, or they risk losing their jobs. Not surprisingly, Nevada’s commitment to indigent defense waned with a lack of independence, and the years that followed saw rural counties move to flat-fee contracting rather than staying in the state system. The 6AC report points out that although numerous Nevada Supreme Court administrative orders have improved the right to counsel in the state’s urban centers, especially in Clark County (Las Vegas) where public defender caseloads are now reasonable and attorney contracts do not impose financial incentives for attorneys to do as little work as possible on a case, fixing the crisis in rural Nevada has proven to be more difficult. A wide variety of reasons exist for this, including a lack of attorneys to do the work, the geographic expanse of most rural counties, and limited infrastructure to train and evaluate attorneys. “Nevada’s rural counties simply cannot shoulder the state’s obligations under the Sixth Amendment of the U.S. Constitution any longer,” Justice Cherry said. “The financial burden will only increase as the U.S. Supreme Court continually clarifies and expands the obligations an attorney owes the indigent accused.” ”We need to fix this problem now,” Cherry explained in calling for a state-funded, state administered independent commission overseeing services in the non-urban portions of the state. The 6AC believes that Reclaiming Justice shows that the people of Nevada have always viewed the right to counsel not as a federal mandate to be resisted, but as a bedrock principle upon which the state was founded. Nevadans should embrace this history and this view today. We hope the recommendations set out in Reclaiming Justice contribute to the restoration of Nevada’s deep-rooted commitment to due process and that justice in rural Nevada will – once again – no longer depend on the amount of money one has in his pocket.